Interesting film this one. A ‘Western’ really which was set in South Africa. Stills from the film above. This one had 50 s pop idol Marty Wilde in the cast with Richard Todd starring. He was very good as usual. 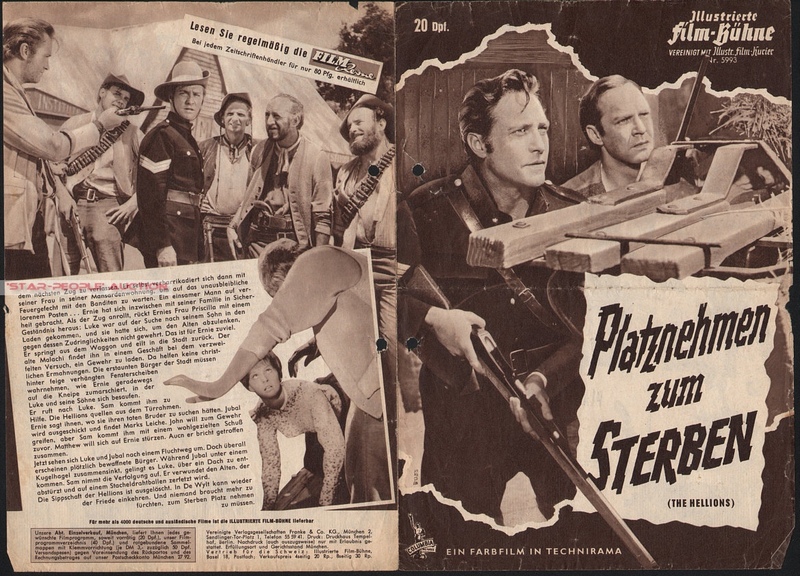 Luke Billings (Lionel Jeffries) and his family have a problem with the new police sergeant Sam Hargis (Richard Todd) so they take over a small Transvaal town with the attention of drawing Hargis into a showdown. Hargis tries to get back up from the townsfolk who do not want to know, so is forced to lay low. As things get out of hand one of the Billings boys takes an interest in the storekeeper’s wife, Priss Dobbs (Anne Aubrey). Having had enough her husband, Ernie (Jamie Uys) takes up the gun and heads down the main street alone. An act that prompts Hargis to join him. Slowly, the townsfolk turn up to back them up. This is a great ‘western’ set against a South African background. James Booth who plays the eldest of the Billings boys, Jubal, is excellent with his soft yet menacing voice. This film marked the debut of one of Britain’s pop idols, Marty Wilde, as John Billings and gives a credible performance. Unfortunately, this film has not appeared on TV, video or DVD. The Hellions is just like a western, only set in the South African Transvaal. The title characters are Luke Billings and his four sons, desperados all, who invade a dusty little town to settle an old score with the newly-appointed marshal, Sam Hargiss. Unable to mobilize the cowardly townspeople for help, and unwilling to face the Hellions alone, Hargiss hides at home with his pregnant wife, while the Billings gang misbehaves with impunity all over town. Finally old Luke Billings makes a pass at the wife of timid shopkeeper Ernest Dobbs. Though wussy in the extreme and a poor marksman, Dobbs is so outraged by this transgression that he marches down the main street with a rifle, to confront the Billings gang single-handed. This inspires the marshal and the townspeople to unite behind him. The film ends with the Hellions dead and virtue triumphant. James Booth is in great form playing this scary and out-of-control character, like a more sinister version of Ernest T. Bass, Jubal delights in firing his gun at whiskey bottles and human beings. He talks in a soft, sugary voice full of menace, laughs maniacally, and walks like a pimp. Weeks away from a shave or haircut, Booth looks young, fit, and handsome. His rumpled, tough-guy rags are torn open to the waist, revealing a strip of hairless chest and flat stomach. As usual, some of his best moments are silent—e.g. the absurd “grooming” scene on the street before he accosts the woman in blue, and the fight scene at the end (where he wields a pitchfork and an axe). Fans of Zulu will notice that certain details of that great film are anticipated in The Hellions. Jubal’s neck scarf and some of his mannerisms carry over to the character Booth plays in Zulu. Also the South African actor Gert Van Den Bergh, who plays Dr. Weiser in The Hellions, will reappear in Zulu as Adendorff. Above – Press cutting from a German Magazine at the time. Somehow this actor promoted himself and his image as Lash Larue so successfully that he remains popular to this day and the Lash LaRue comics which sold in great umbers originally are still very collectible. Alfred La Rue was born in Gretna, Louisiana June 15, 1917. After military school, he attended college in Long Beach, California, where, intending to become a lawyer, he also studied dramatics to correct his lisp and stammer. Instead, he became a hairdresser who desperately wanted to be in the movies, but throughout the 1940′s was often rejected by directors who felt he looked too much like Humphrey Bogart. La Rue refused to give up and began to win small bit parts. A friend, actor George Brent who starred in several films with Bette Davis, suggested Al try his luck at Universal Studios. There, he met star Deanna Durbin, who put in a good word for him. He was placed under contract and appeared in Durbin’s musical, Lady On A Train (1945). La Rue followed this small success with a tiny part in The Master Key (1945), and then he won a secondary role in the new Eddie Dean western series. In Song of Old Wyoming (1945), La Rue played “The Cheyenne Kid,” who, dressed in black, began as a bad guy and ended up on the side of the law. As Cheyenne, he learned to expertly and sadistically use an 18-foot bullwhip, which he wrapped around his holster, lashing it lightning fast and loud as a bullet. With his new popularity, the handsome Al La Rue, now billed as Lash La Rue in honor of his bullwhip talent, was elevated to his own series in 1947 in which, still dressed in black, he continued to play Cheyenne, with his perpetual snarl. The first film was Law Of The Lash (1947), which was quickly followed by Return Of The Lash (1947). By the 1950′s, Lash dropped the Cheyenne moniker and played a character with his own name, Lash La Rue. In 1951, he narrrated his own 15 minute televison show in which he introduced clips from his movies. A Lash La Rue comic book soon followed. 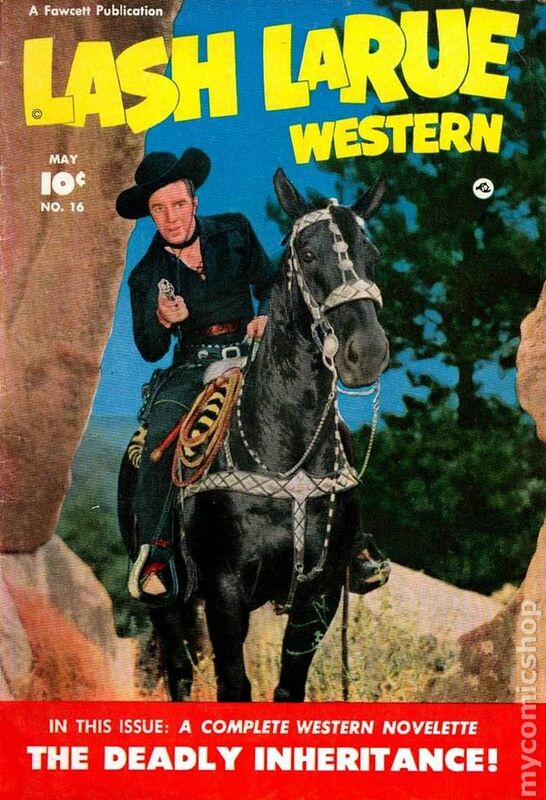 His best film is considered by many to be Lash Of The West (1953). In the early 1950′s, most of the matinee movie cowboy heroes had ridden into the sunset, though Gene Autrey and handsome Roy Rogers along with his beautful wife Dale Evans, had very successful television shows. The production of cheap “B” westerns began to wane, and Lash, though very popular in these movies, was never a big movie star. Soon, La Rue became a headliner in rodeos and carnivals. In 1956, La Rue was arrested in Memphis for receiving stolen property. In 1958, he tried to kill himself with sleeping pills after his then-wife refused a reconcilliation. When his tenth marriage broke up in 1963, his wife received the restaurant-motel business they owned, and four days later his entire collection of fantastic western costumes, whips, guns and saddles was stolen. In 1964, he took out a large ad in a Hollywood trade paper, apologizing for his behavior and asking for acting work. He was reportedly selling furniture in Atlanta in 1965, and in 1966 was arrested for vagrancy in Tampa. Not long after, Lash stated, “The Lord opened my spiritual eyes,” and he became an evangelist preaching around the nation at the same rodeos and country music festivals he used to perform at. In 1974, Lash tried to trade one of his bibles for marijuana with two teenage hitchhikers he gave a ride to. He was tried and convicted. La Rue also appeared in Chain Gang (1984) and the science-fiction films Dark Power (1984) and Alien Outlaw (1985). He made a cameo appearance in the television remake of Stagecoach (1986), and had roles in Escape (1990), and Pair Of Aces (1990). In his last years, La Rue continued to drive around Hollywood in his 1968 black Cadillac hearse with a bumper sticker that read “God Loves You” and lived on social security and “love offerings.” La Rue was also a popular speaker at western and nostalgia conventions and film festivals. Throughout the 1950′s, LASH LA RUE appeared many times on various TV shows and had several different roles in the movie “Judge Roy Bean”. He also had a continuing role as Sheriff Johnny Behan on the TV series “The Life and Legend of Wyatt Earp”. After interest in Westerns faded, he made a living by making appearances at conventions for Western film buffs. Lash became a born-again Christian and an evangelist on the rodeo and country music circuit, but he had financial troubles and problems with the IRS which made it difficult for him to work. Late in his career he appeared in 2 low-budget horror films (“Alien Outlaw” and “Dark Power”) and he returned often to his native Louisiana where he would appear in jam sessions at the “Dew Drop Inn”. He was a very good guitar player, popular and well-liked by many. Lash La Rue died at age 79 in Burbank, California on May 21, 1996 from Emphysema. He is interred at Forest Lawn Memorial Park in Glendale, California.